The last nut and bolt has been fitted at Griffin Mill Lock to complete the installation of the paddle gear making ready for operation for the first time in many years. 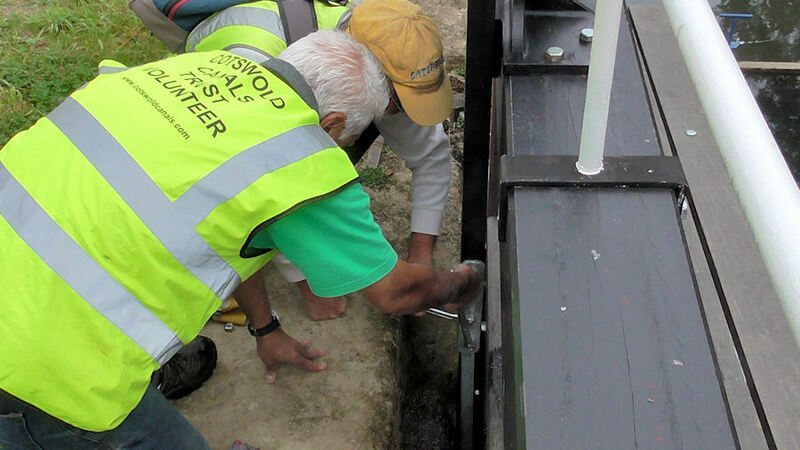 The restoration of the lock and spill-weir was initially undertaken by a team of Cotswold Canals Trust (CCT) volunteers led by Steve Hake. The latter stages have been overseen by Jon Pontefract of Stroud District Council. Jon has coordinated the efforts of local volunteers and four Waterways Recovery Group (WRG) work camps. Below are some reminders of the process leading to successful completion of the Griffin Mill Project. Finishing, final drilling and installation was carried out by CCT Western Depot volunteers. 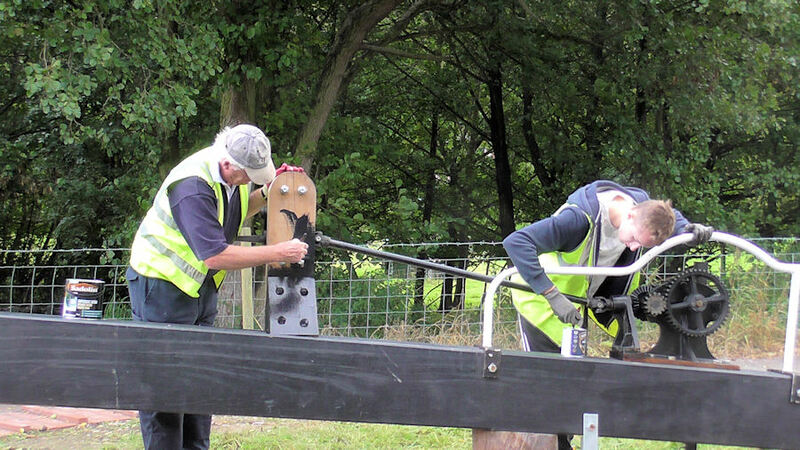 "Invaluable experience was gained during the lock gates and paddle gear installation at Wallbridge Upper Lock, the only other 'Thames & Severn' lock to have been fitted out so far. "The knowledge gained has enabled the teams to adapt to the inevitable variations encountered in a structure created in the 1780’s." 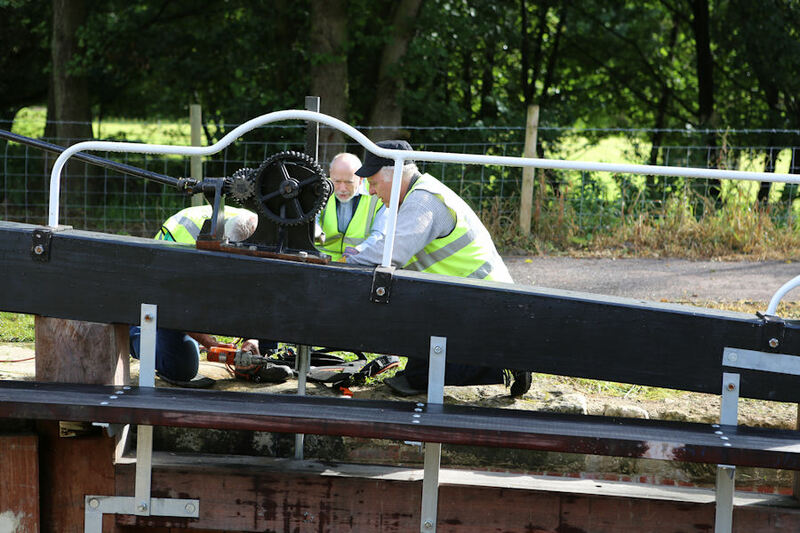 "The standard of work done by all the volunteers gets better all the time, so it’s not surprising that this is definitely the best lock restoration yet. As always, we’re very grateful to everyone who has freely given their time. Without them, we wouldn’t have a canal project." Click on the links below to view previous reports on Griffin Mill. Support the scheme – Join the team! In the meantime the professionals and volunteers will once again be working together on the nearby Bowbridge and Ham Mill Locks. Click here to read about volunteering options and benefits. Click here,or on the icon below, to register as a CCT Volunteer.